Monster Spray -- It really works for our family! Yesterday, after weeks of begging from the kids, I pulled out all the Halloween decorations and books. (I can't believe we have two huge crates full of stuff!) In the weeks leading up to Halloween, we will be talking about vampires, monsters, zombies, and of course GHOSTS. It is only a matter of time until my boys say they are scared of monsters in their room. 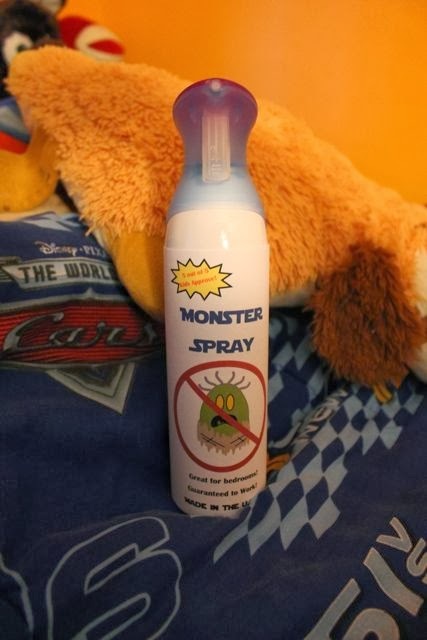 Ever since, my six-year-old son was in a big-boy-bed we have kept a bottle of air freshener in his room for times when he was scared that their may be monsters. When we started using the MONSTER SPRAY, my wife or I would simply say, "Oh, let me spray the MONSTER SPRAY under your bed to keep the monsters from coming into your room." Magically it worked! It was all he needed. Along came his little brother and he had the same fears. This time we didn't have to explain the power of the MONSTER SPRAY. His big brother told him how it worked, "Mom and Dad will spray under the bed and everything will be okay." I was a little more creative this time around and created a hand-drawn label for the bottle of air freshener. I even drew a silly monster and added a few advertising slogans. Last night, I had a few spare moments so I designed a printable MONSTER SPRAY label. I hope this keeps all those creepy creatures from bothering your little ones this Halloween. Just download, print, cut to the size of your air freshener bottle, and tape it on. Wishing your family only SMILES this Halloween!